As stated before, creating fire with friction is something that has been done for centuries. While it does seem simple to do, I would suggest that you practice it before going on your next camping trip. 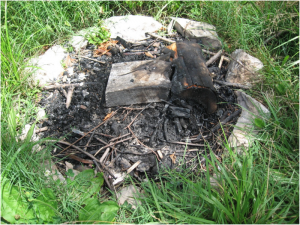 Prior to using your tools, you will need to get your fire area ready. This means preparing a fire ring and laying out your tinder and other fire making wood. Next, you will need to find a “nest” for your spark. A good choice is one that does not have much and/or is not wet. If you cannot find that, consider shaving off bark from a cedar or using very dry grass. For the later to work though, one must make sure the grass is really, really dry. A better approach is to combine the cedar and the grass. Now that you have a home for your spark, you will need to pick a location by which you are going to start your fire. You do not want to be too far away from where you have built your fire pit area. Once you have gathered these materials, the next step is to start making fire. You will need your spindle, fireboard, and thunderhead. You will also need a long piece of rope or a bow made from a bent piece of wood. Either of these will work and their only use is to spin the spindle. Next you will need to lubricate the pointed end of the spindle. This can be done by rubbing sap or sassafras leaves on this end. Now, place the other end of the spindle in the hole on the fireboard and the lubricated end into the hole in the thunderhead. Now, hold down the fireboard with your feet and apply pressure to the thunderhead while “sawing” with the bow. If you are using rope, wrap the rope around the spindle so that the ends are free. Once that is done, pull the rope so that causes a back and forth action with the spindle. Continue to do this until you have made a slightly bigger hole in the fireboard. At this point, place your fire making tools down and create a small “V” cut into the hole. This hole should be as close to the center of the hole as possible. Smooth out the edges and place back on the ground. Place the spindle back on top of the fireboard and top with the thunderhead. If you are using a rope, remember to wrap it before placing the spindle on the fireboard. Also, add additional lubrication to the pointed end of the spindle before topping with the thunderhead. Once that is done, you are now ready to start to make a fire with friction. A golden rule to follow is to apply a little pressure on the thunderhead for 20 strokes and then a little more for another 20 strokes. Finish off with the most pressure possible for the last 20 strokes. If all goes well at this point, you should begin to see a little smoke but do not stop. Continue until you see a spark. Now, gently place your spark in your nest or cedar/grass combination and gently blow. Carry on with the blowing until you see flame. Next, place it on your tinder. If you are reluctant to hold “fire”, place your lit fire bundle on the tinder and blow. While starting a fire using friction is a learned skill and does take time to master, it is a very important skill to know. This is especially true when modern conveniences do not light.